Hida / Takayama is a traditional medieval town located in the mountains of Gifu Prefecture. It is possible to walk across the centre of Hida Takayama in about 20 minutes, and most of the attractions are concentrated in the old part of town, within minutes of each other. Enjoy a stroll around this museum-like town, dotted with attraction after attraction, including a variety of small museums devoted to traditional crafts embodying the town's long standing tradition of the fine craftsmanship. Visit the Old private houses that lie in the area between Miyagawa River and the famously lush and picturesque Shiroyama Park. This quite residential area is replete with shops selling traditional wares, antique shops Japanese-style inns, sake breweries and restaurants serving local specialities. Take a day trip to Shirakawago, a remote and mountainous region in Northern Gifu Prefecture, is famous for its old farmhouses that were added to the list of UNESCO World Heritage sites in 1995. 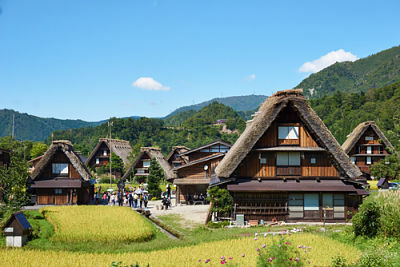 At the Hida Folk Village you will find restorations of more than 30 typical old thatched-roofed gassho-zukuri houses, relocated here from the various places around the Hida area. The site recreates the atmosphere and scenery of mountain villages of old in a beautiful mountain setting. Located on the banks of the Miyagawa River, Takayama Jinya Market and the Miyagawa Market are open daily from 7am to noon. Here you will find people from nearby farms selling fresh produce and flowers.